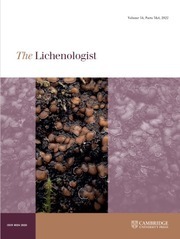 The Lichenologist is the premier scientific journal devoted exclusively to the study of lichens worldwide. As the leading forum for the dissemination of new concepts and topical reviews, The Lichenologist reaches more scientists concerned with the study of lichens and lichen symbionts than any other single journal. All aspects of lichenology are considered including systematics and phylogenetics; molecular biology; ultrastructure, anatomy and morphology; secondary chemistry, effects of pollutants and use as bioindicators; biogeography. In addition to standard length research papers, the journal also publishes Short Communications and Book Reviews. A monthly issue may occasionally be devoted to papers deriving from a symposium. Microlichens of the Pacific Northwest. By Bruce McCune. 2017. Corvallis, Oregon: Wild Blueberry Mediahttp://www.wildblueberrymedia.net - Volume 1 - Key to the Genera. Pp. iv + 218. Page size 197 × 260 mm, weight 1·8 lb (0·8 kg). ISBN 9-780998-710808. Hardback. Price: US$54.00. - Volume 2 - Keys to the Species. Pp. iv + 755 pages. Page size 197 × 260 mm, weight 4·9 lb (2·2 kg). ISBN 9-780998-710815. Hardback. Price: US$66.00. - Vols 1 & 2 ordered together: US$98.00. - Shipping within the USA is free. International shipping is by USPS Priority Mail International (e.g. Canada US$ 45.95, Europe US$ 66.50).